My father was born on 3rd November 1902 in Lahore, India. His father was the Station Master at Lahore Station working for the East India Railway. By the time my father was born his father had died. Reason not known. My father died on11th November 1973 and could not have died on a more fitting day than Armistice Day. His departure from the Lancashire Fusiliers was premature due to the partition of India in 1947. He had another 13 years to serve and never accepted life as a civilian. 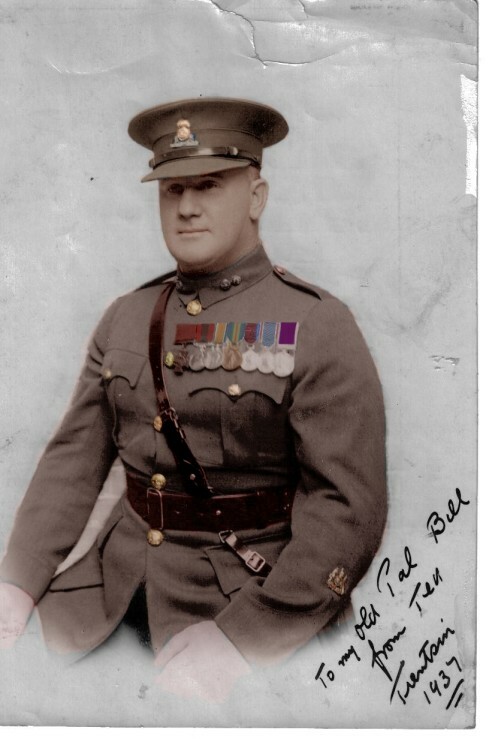 His records show that he enlisted in Karachi, India, in 1919 with the Duke of Wellingtons and went on various postings abroad until he joined the Lancashire Fusiliers in Tientsin, China, in 1935 as a Bandmaster. Also during those intervening years 1923-1932 he attended the Royal Military School of Music, Kneller Hall, where he gained the LRAM and ARCM. He also won the coveted ILES CUP for the best original composition for brass bands which was presented to him at the Banquet of the Court of the Worshipful Company of Musicians by the Master, Sir Ian Marsh, KCMG., DL., JP., on the 15th May 1931. My father and mother married on 9th June 1924. The eldest son, William Frank, was born in England 1925 followed by myself in 1932 then two more sons who were also born in England. The next brother in line, Ronald Ernest, was born in Tientsin 1938 followed by twins girl and boy in Quetta 1940 and lastly a girl in Cawnpore 1943. In all, he had five sons and three daughters. He came back to England after partition in 1947 and served another two years before leaving the Army in 1949. He always taught music sometimes full time and sometimes part time. Just before his death in 1973 he formed and conducted the Nottingham Youth Orchestra and was justly proud when one of his outstanding pupils won a place with the International Youth Orchestra. do not know the occasion. "ILES CUP" is shown at the far right hand end of the mantlepiece." by the American, French and British governments. RSM E Smith VC,and Bandmaster Bill Elliot in China 1937. Hazel on a trike with Gwen Fig inside the married quarters concession. It was walled and gated. Hazel sitting in a rickshaw which was taking her to afternoon tea with an American family in the American quarters, as my father was very friendly with many of the American Officers. They loved the British families. The Americans are also present at a party - the extreme left hand girl being carried is Hazel. The other children were also families within the contonment. 1940 - Bandmaster Elliott carrying Ronald Ernest aged 2 . Frontline: Frederick Hazel and Edward. 1940 - Quetta - First fall of snow for over a century. L to R Hazel Elliott, Freddie Jones, Beth Parker and Mary ? This snow was on the parade ground/football ground. The barracks are in the background and on the far right is the cookhouse which had three chimneys. It was nicknamed "The Queen Mary"
1941 - Quetta - Wilf Jaggard. He was a Band Sergeant in my father's band in China, Tientsin. Lucknow - - Same show - my father conducting the band. 1945 - Lucknow - This very sad morning when the four eldest children left for boarding school in the Simla Hills. then going to OCTU and joining the Royal Artillery eventually becoming a Captain.